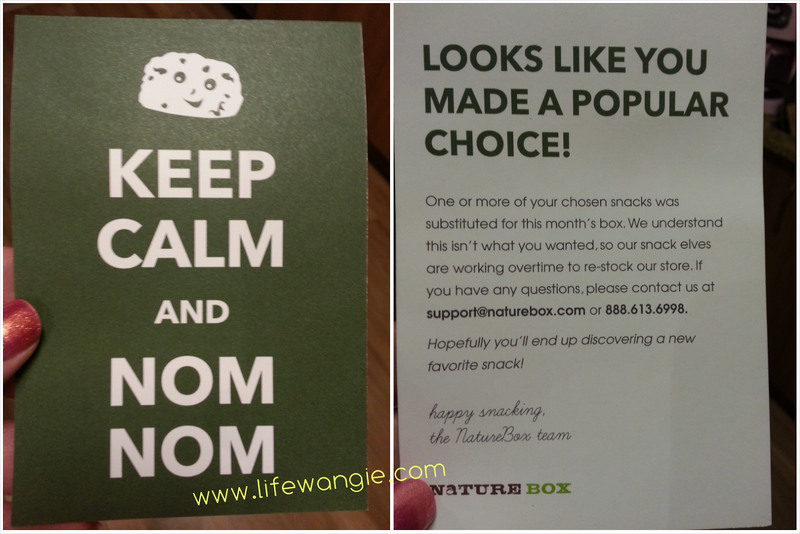 If you've been reading my NatureBox reviews, you might have noticed that each month, I order more and more stuff from NatureBox. This month was no exception. They make it so easy to customize your box and add on items that we went nuts and got 16 items this month! You can use code PGB4M to get $10 off your first month! The box was stuffed pretty full. Maybe I should try to buy more next month; what do you think? We really enjoy their snacks though, and add-ons reduce in price the more you add on. The cost of this box of 16 snack packs was $44.95, so that's about $2.80 per package, which to me is a great deal for natural, wholesome snacks. That having been said, there are some items that NatureBox has that are worth more than others. I packed our order with nuts, granola, and stuff like that. But it turns out that they ran out of a few things and replaced them with lower-quality items like corn sticks and some weird Cheddar mix that had crusty corn chips stuck together and corn nuts in it. That crusted up corn chip looks so gross, right? Maybe they remembered weed was legal in Washington State now and that's why they sent it here. It actually tasted OK, but was a bit too crunchy-slash-hard for my tastes. And anyone who has ever known me knows that I have a lifelong hatred of corn nuts. Good thing hubby will eat almost anything. Overall, I was pretty disappointed because the items that were missing were a couple of packs of nuts and a pack of granola, and the stuff they replaced it with were processed foods. And the invoice just said "Try This Instead of... " the thing I really wanted! No Thanks! There was a card in the box that said "Keep Calm and Nom Nom" on one side and explained on the other that things were missing because they were out of stock. No! I don't want to be calm! I want my Dark Cocoa Almonds! I thought that card was kind of rude. It doesn't even apologize. It's a bit too cute and snappy. But luckily their in-person customer service was much more friendly. I semi-calmly emailed them and let them know my disappointment. They responded first thing the next day and gave me a $10 credit toward next month's box. They also explained that they are working on improving their system so they know what kind of snacks people like, and they have a new taste quiz. So I took the quiz and I am happy with their customer service. 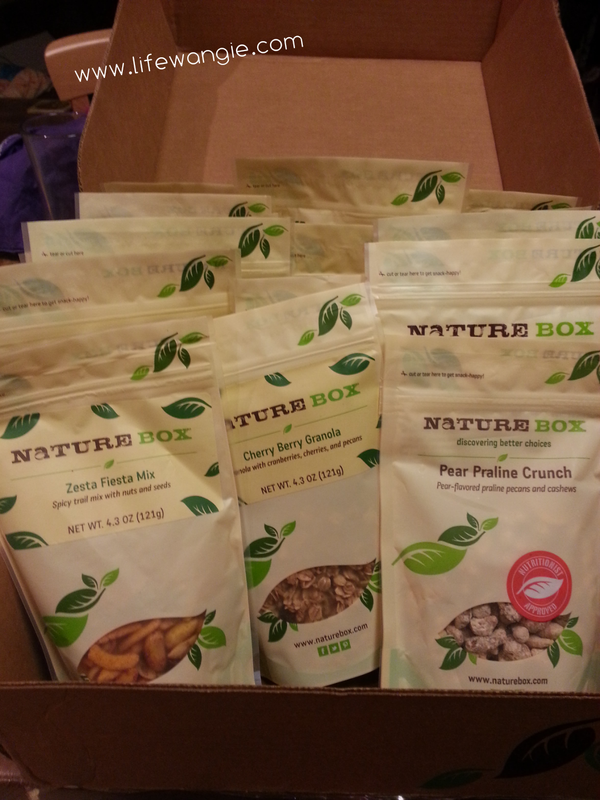 Overall, despite my disappointment in the replacement items, I'm still happy with NatureBox because of the great customer service and the fact that all of the other snacks are really good. Even the replacements, which would not be my choice, were appreciated by the hubby. So I'm sure we will be sitting down soon to load up our box again for next month! 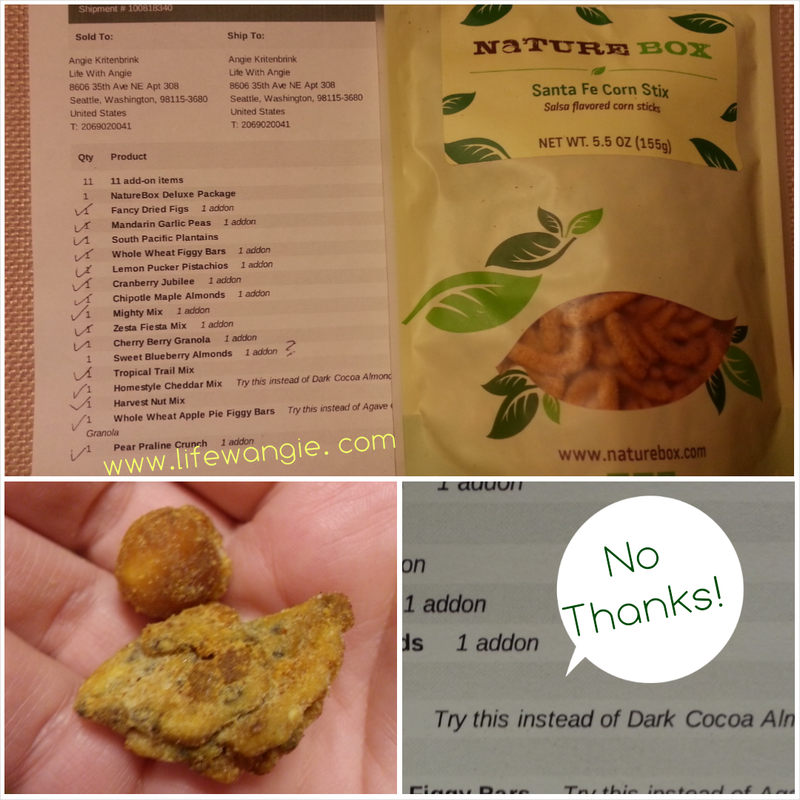 We tried a lot of new things this month, so I'll probably post again in a couple of weeks with our impressions of all the NatureBox snacks we have tried so far.